In recent years the worldwide production of polymers has exceeded twenty billion kilograms per year. Nearly all polymer systems are currently strengthened with added filler particles. 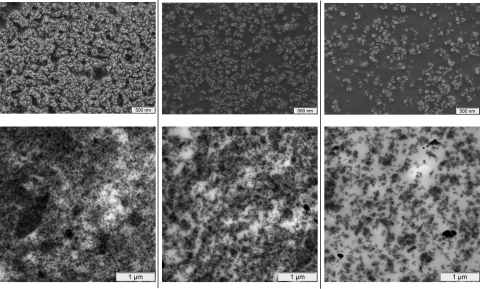 These particles are incorporated into the framework of the polymers. Despite the huge industrial importance, the mechanisms of this strengthening are poorly understood. Usually nanoparticles of silica (silicon dioxide) or carbon black are used. Yet no clear reason appears to exist for the use of such particles as the theory states that the elasticity of the material is independent of the particle size. However in 2013, researchers from this Industrial Partnership Programme demonstrated experimentally that this is not always the case. The FOM researchers studied, in collaboration with Michelin, SKF and the Dutch Polymer Institute, rubbers and polymer gels filled with silica. One of the most important results from this year emerged from systematic experiments: if the relative quantity of filler particles is higher than the critical volume fraction, the mechanical behaviour of the material was dependent of the surface of the filler particles. In the case of smaller filler particles more of the filler is on the surface, which leads to a greater strengthening of the material. This discovery enabled the researchers to predict the mechanical properties of the material based on its microstructure. However, the discovery also posed the researchers a problem: in 'normal' calculations with elasticity theory, the elasticity of the material is independent of the size of its filler particles. That is because the theory is scale free: it does not matter whether you deform a microscopically small quantity of material or a macroscopically large quantity, the relationship between the force (stress) and the deformation (strain) remains the same. The research group's findings therefore pose physicists with a fundamental problem. Both industry and science agree that nanoparticles are the best filler particles, as their strengthening effect is the greatest. Yet the same researchers often use micromechanical models to make predictions about the strengthening. These are based on elastic models and therefore cannot explain the scalar independence or predict this. So there is enough to think about for the time being. Nitrilbutadiene rubber (NBR), i.e. nitrilrubber, with silica filler particles of different sizes.